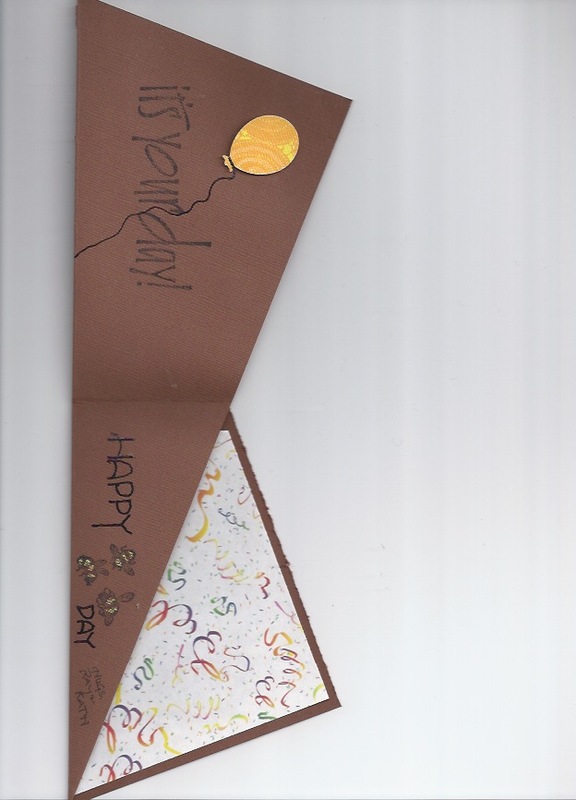 I loved the idea of this card as a way to send a Money gift card.. giving money even a debit type card seems so impersonal so if I can make the holder a little more personal than the folder they ususally give you with the card ( if they give a holder at all) is important to me… and this was just the perfect answer… Its quick …its simple especially if you use duplex paper ( her word is designer) which means there are coordinating colors/ designs on both sides of the paper, then you don’t have to cut paper to insert. Remember when you are adding something like a gift card you may want to be sure to pay to track it so you know that it arrived , it’s not much. Also you will probably need to add additional postage like the 66 cent butterfly stamp or any variation of stamps to add up to that amount. It’s gonna make a bump in your card and it probably going to go over an ounce. This was the one I did and I did insert a gift card in it. 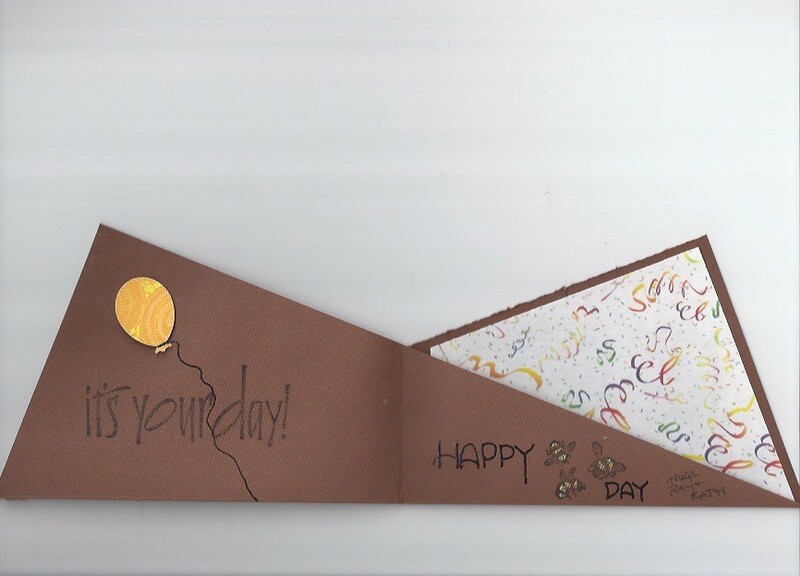 I really do like this card for using with gift cards, tags, notes, money ( folded origami style of course) etc. Even a photo would be good but you would have to print it smaller that 4×6. Business card size would be good. I have a great friend JANIS in OK..who not only reads the blog…lol but actually makes things from my posts. 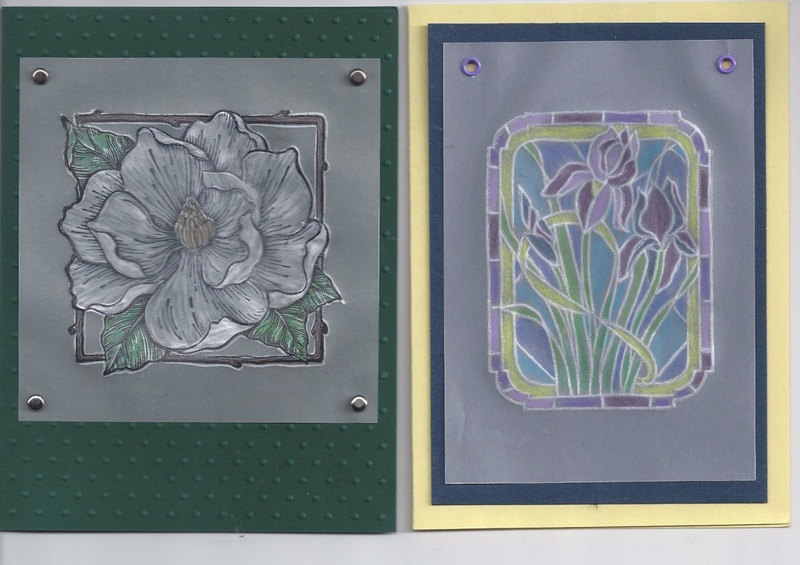 These are two of the birthday cards I received from her and they were both done it the VELUM DRY EMBOSSING style . The Magnolia is just stunning and the Iris done sorta like a stained glass window is also just lovely… She told me that she added the color on the back side of the images using colored pencil. 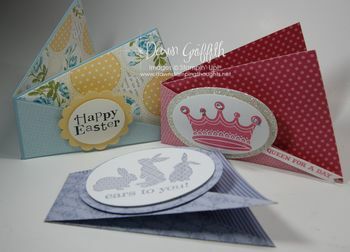 I think she would also agree that the images show up better against a dark background in this case her’s were on a dark green background an the Magnolia was on the same background but she had used and embossing template to make the background appear polka dot. As I have said before I AM SUCH A LUCKY GIRL. THANKS JANIS for enhancing my mail box and for following my blog. 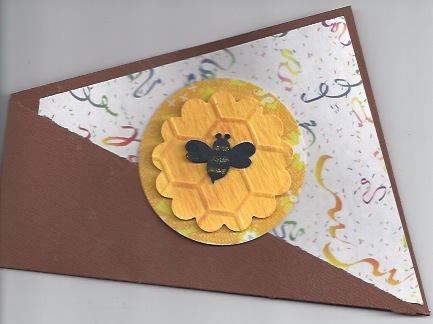 This entry was posted in Cards, Folding/Origami, Technique by kath. Bookmark the permalink.